An awesome August of scintillating football has come to an end. The premier league has begun and it has started to make inroads to yet another blockbuster of a season. One such team that came into the season with a lot of skepticism was Chelsea. A new manager getting appointed just a few weeks before, a new system of play, almost everything new. The fans itself thought it’ll take some time before the Italian weaves his magic. But, what has happened is completely different. 4 wins out of 4, 10 goals scored, Chelsea has started the season with a bang. The Blues recording their latest victory at home against Bournemouth. A comfortable 2-0 which saw Chelsea seeing most of the ball. They created tons of chances, 24 shots in total. The way they played could be clearly seen by the possession, having 72% of the ball isn’t an easy task and the Blues did it in style. Maruzzio Sarri is starting to implement his famous style of play which attracted the eyes of entire Europe. In patches, the fluid passing, high pressing, short forward passing game looks beautiful. 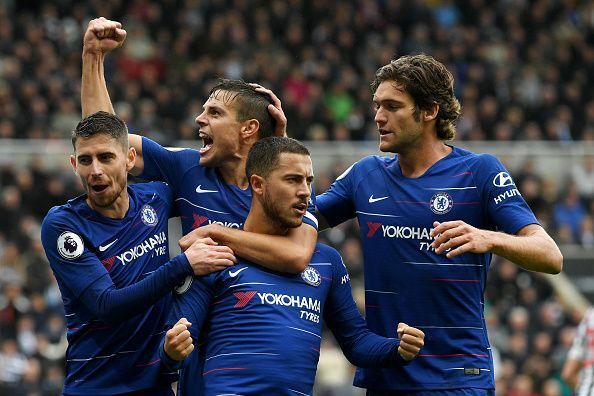 Sarri ball is starting to take its effect on the Premier League and if they could keep this up, Chelsea will be a serious title contender come to the end of the season. Bournemouth did create some good chances but failed to score. Joshua King and Callum Wilson were good but lacked finishing. They made the runs but couldn’t convert. Chelsea’s defense looked dodgy sometimes, but they are improving all the time. Eden Hazard is starting games, scoring goals. Pedro’s start to the season is immaculate. The midfielders are doing a terrific job, especially the new signings were fabulous. Morata had a decent game but should improve his finishing which will be needed more for the fixtures to come. All in all, a fantastic start to the season, results elsewhere are in favor of the Blues until now. If Chelsea continues and improves on this new style of play, who knows where they’ll end up by the business end. All in good time is the only thing as of now. The next fixture is a good two weeks from now as the first International break of the season begins. Hope, no players are injured and Chelsea will again emerge as one of the best in England.